Then we have the books to date each of which manages to cover so much of this world because every last book has a different story and a different focus with a different protagonist and segment of the world. Except… this is an issue for me with the short story anthology, exacerbated by me not having read the books, especially the earlier books, for some time. I don’t recognise enough of the characters in the early short stories to really understand what is happening or what is relevant. I don’t mean they’re bad stories – I really liked the feel of Other Reasons – for example. In fact, not only did I love it I was desperate for more – because it felt like I had missed most of the story and came in half way. I wanted to know the rest of this story because there wasn’t enough there for it to stand alone for me. I feel much the same for Wicked Stepself, I really like this story (despite the second person format which I really hate) – a wonderful, powerful surreal session and a really powerful core for a whole new story which I really really want to follow more. But I’m just not sure how this relates to the rest of the series - can feel it, but with my fuzzy memory it feels like a new story in this world. One I really really want to read – but not one I find connected to what is currently there. Stainless was much better at standing alone. A beautiful, surreal story of a woman in a sexist society, being abandoned and shamed for having a child – finding strength and purpose in a really creepy and terrifying setting. Surreal, powerful – but slightly disconnected from the rest of the book, and the series. It felt like something completely separate. I think the same can be said for Winter War – again I have to stress I liked this story and it did add so much to the surreal nature of the world and a beautiful snippet into this wild and wonderful world… but not exactly connected to anything else. I say the same about Her Daughter, Pinned to the Sky again awesomely shows off the world, the surreal nature, the amazing powers being raised. Same statement again with the Endless Silence of Forgotten Things and the Far City Cheer Squad. Eden Falls would almost be the same except I do kind of remember Simon – so I think this is more stories for this character who may not be a major character yet but is definitely heading that way. I wouldn’t be surprised if the next book in the series is his book. It also (broken record time but it’s true) addresses the surreal, creepy, morbid and beautiful nature of this world: and Simon saving people from a prison of their own making, a prison they want to be part of, a prison that they will tragically miss. Children’s Game was much better for me since it took the story of Marley and the kids she looks after. I loved this story – it was so much fun and I still don’t know how real it was. It was fun, real, surreal – and slightly tragic and spooky as well. Really that kind of ideally thematically summarises the whole series. Branwyn and the Stone also takes one of the main characters – Branwyn. This book also contains wonderful keys to future stories with this new challenge of creation. And I really loved loved loved her interactions with her activist grandmother who is awesome. I love the lesson she has – of course you fight for justice. But why? What are you fighting for? What do you intend to achieve? Are you just bashing your head open against a brick wall? Wild Hunt Goes to School is the final story that continues a previous characters’ story. We know that the Hunt was created – but what do they do from here? And with what we know about ghosts they really raise an awesome ethical dilemma as well because nothing in this world is ever simple. Nothing can be subtle. There can’t just be an evil monster that needs to be killed – we need more complexity than that. 10 Ways to Refuse a Faerie this was fun. Completely fun. And so very funny. I would read this whole book for this story, yes, yes I would. For LGBT people we have Brynn in Wild Hunt Goes to School. Technically. Like I know AT is Black, I know that Brynn is a lesbian because what I read in Wolf Circle. But there’s no real indication in this book of AT’s race or Brynn’s sexuality. It’s only inclusion because of outside knowledge. 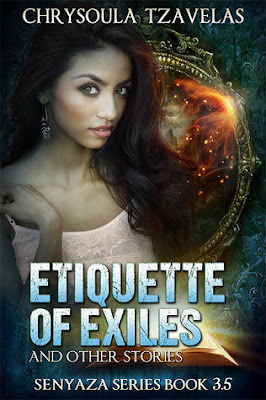 There’s a potentially implied gay character in Etiquette of Exiles – but it really is down to looking for subtext and stretching it. Far City Cheer Squad probably has a trans character – Ramone rather than Ramona though again it’s heavy on implication rather than expressly stated. A lot of these stories did an excellent job of showing of this world. I’m not going to repeat myself more because I’ve already said it over and over – but I really do like this creepy, surreal, powerful, immense world setting and so many of these stories really displayed it to the full. This book just did an excellent job of really bringing home what this world is and what this series really is. I don’t think there was a story in it that didn’t love.